Doctor Who: THE THIRD DOCTOR #5 Review @comicstitan | Warped Factor - Words in the Key of Geek. Tony heads to Twitter. #MorePertweeTitans. 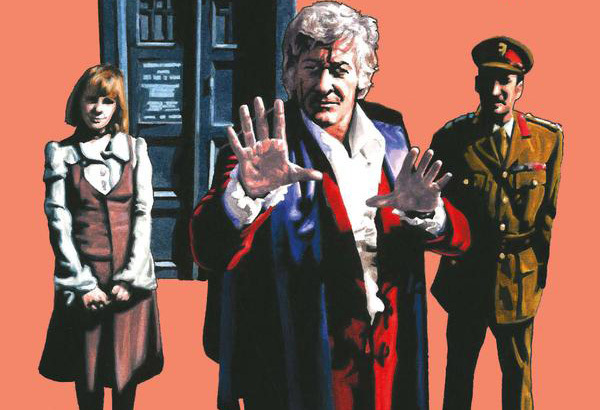 Throughout the course of this short run of Third Doctor comic-books from Titan, we’ve been clear in our love for them. They’re possibly the best Who-related comic-books released by Titan in (mostly) 2016 – which is saying something, given the strength of some of the Twelfth Doctor’s adventures last year, the Eleventh Doctor’s uber-arc with Abslom Daak, and the return of the Fourth Doctor and Sarah-Jane to the comic-book world. Issue #5 wraps up the run, and delivers a whole lot of logic, taking us from the trippy end of issue #4, and from the world of Seventies UNIT, through several gorgeously, queasily angled pages from artist Christopher Jones, simply and effectively showing what’s going on and landing us in the 1800s, to what is actually a fairly simple but absolutely on-the-money Third Doctor confrontation sequence. Like the Third Doctor and the Master vying for the ‘soul’ of the Sea Devils, this story culminates with a stand-off in the chamber of the House of Commons, no less, as the ‘magician’ who’s been behind the micro-machines that have given the Third Doctor story its technical threat lays their advances and their services at the theoretical feet of the British Empire, arguing that all they want is to serve that Empire’s vision for the world. It’s a conceit that works absolutely in sync with the character’s on-screen history, while allowing the Third Doctor’s time to resonate from every panel, as the frilliest of the Time Lords uses a détente he achieved during the battle for Jo’s mind earlier in the story – and more or less ignored since – to agitate against the dark heart of the machines’ master (ahem), and their designs. Paul Cornell crams this fifth instalment with treats: the UNIT boys and girls on a helicopter streaking through the skies of Victorian London; the villain coming across distinctly Doctor Octopus, drilling through the floor of the Commons; secret passages into the chamber; possibly the first deployment of a ball-gag in Doctor Who history (you know it’s been missing); a key Pertwee villain jumping into the Thames; a historical cameo by a serving Prime Minister; but most of all, the real joy of this story is the re-match between the Doctor and the micro-machines’ master in a way that reminds us quite how formidable they were, how impressive and insidious, and how, given different scripts, they could have become a more regular villain in the world of Seventies and Eighties Doctor Who. Cornell is one of the writers connected with Who on whom, whenever he turns his hand to it, you can absolutely rely. 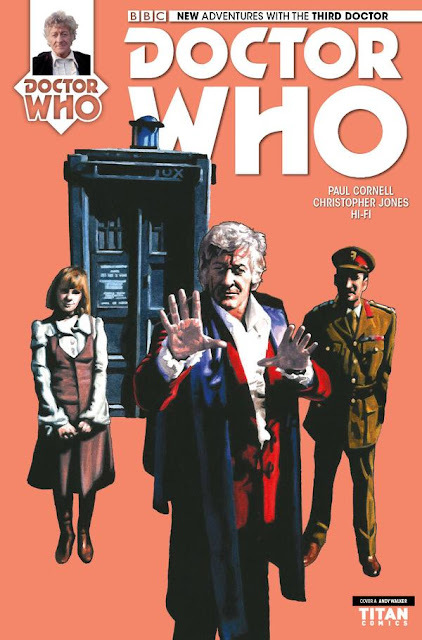 The Third Doctor story has been no exception to that rule of thumb, and issue #5 gives us a conclusion which, while having a certain amount of visual dash is more about a giant potential question-mark point, a tipping point in history, in the style of Masque of Mandragora, with the Doctor and friends having to run and talk and do extraordinary things to keep history on the path they believe is ‘right.’ Jones’ artwork has brought a combination of traditional Third Doctor style and a highly modern sensibility that takes the Seventies edge and the Seventies budget off, allowing UNIT and the Third Doctor’s world to feel as real as our own. Hi-Fi on colour too has excelled throughout, and gave earlier issues a solid twang of psychedelia when it was strictly called for. There’s less flash and dash about this issue, allowing us to race to the finish as we instinctively want to in a final issue or episode, focusing on the story, with decisions like Jones’ odd angles at the start of this issue actively helping it along, giving just enough weirdness to the situation, without forcing us to pause and get distracted by the high-colour opulence of the Victorian world. No, here we’re straight on, from arrival in the past to chasey-chasey Third Doctor action, villainous grandstanding in the mother of parliaments complete with ball-gag, classic ‘my case is more persuasive than yours’ showdown and at least one surprise villain disappearance, meaning the baddies from this storyline would be available to get back in business should Titan decide to bring the Third Doctor back for more comic-book adventuring. We know popular votes, multi-million-signature petitions and the like are not having their finest hour at the moment, but can we say ‘Twitter Campaign’? It’s well recorded that Pertwee, after his failed push for more money in the role, ultimately regretted not doing more Doctor Who. We’d regret it if Titan didn’t do any more Third Doctor comic-books, not just because we’re frankly greedy, although we are, but because the Third Doctor adventure has been a significant high-point in 2016’s Who output, Cornell, Jones and Hi-Fi working together to pull off something beautiful – a Third Doctor story that feels utterly authentic to the time, and yet simultaneously thoroughly modern and emotionally tuned. We love exquisite standalone jewels as much as the next fan, but still…it’d be a shame if it had to stand alone. Of course, that probably depends on colder, harder facts than fans at any point want to have any truck with – the Third Doctor stories need to sell, and sell in quantity to make it worth Titan’s while to commission some more. So what are you waiting for? Go collect issue #5 and complete your Third Doctor comic-book collection…so far.